This cruise is sold out! 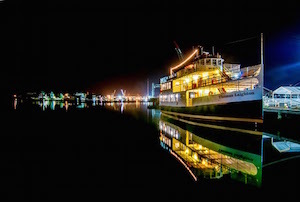 Come celebrate UNH graduation in style aboard the M/V Thomas Laighton. Dress your best for this formal event and get ready to rock the boat. Our DJs will be playing the best dance music and our bartenders will be slinging great drink specials all night long. Round trip transportation is included with your ticket. Our buses will pick you up in A lot at 6:30pm and bring you to our dock. At the end of the evening you'll be bused home and dropped off downtown so you can continue the celebration. This event is 21+ and for UNH students only. You must have a valid state issued photo ID to board the vessel. No backpacks, alcohol or other illegal substances permitted. Bags are subject to search. Copyright © 2019 Isles of Shoals Steamship Company. Office hours vary due to the seasonal nature of our business. Please check our most up to date hours by giving us a call at: (603) 431-5500. Hours are updated weekly on our automated phone system.